Besides the Spirit of Speyside festival events we also visited several of the famous whiskey bars in the area. Located just up the road from our apartment (completely on purpose) we spent the most time at our favorite wee pub in Scotland. 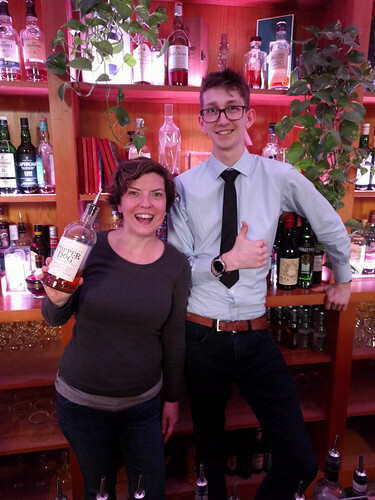 Over the last few years we’d seen way more of Lindsey—who Leandra got to chat with for about ten minutes between events—but this year it was Angus who kept us entertained and full of whisky. Ask him about his scary, potentially rabid, badger experience. Benriach peated cask strength (cask 1) – smooth, only needed a few drops of water. Pleasant smokiness, some chocolate and cinnamon. Nice finish. Pleasant but not outstanding. Gordon & MacPhail Bruichladdich 8 – nice medium smoke, very lovely. Ardbeg Kelpie – surprisingly well balanced, medium smoke, big long finish. Some chocolate and iodine, some red wine. Burnt marshmallow. Mortlach 10 – Nose of spices, soaked raisin. med richness with spice, tropical fruit, lt oak, leather. Young, but nice medium flavor. ‘Sweet and spicy with a savory kick’ (Glenburgie 71.43) – lovely toasted notes with stewed fruit. ‘A class apart’ (Glen Scotia 93.74) – BBQ meat with medium peat. Juicy, with a char finish that drops off after 5secs or so. Opens with water, a bit of perfume and char. Char finish, lingering. ‘Pine smoked salmon and burning heather’ (Ardmore 66.99) – smoked salmon! Iodine, light smoke. Med sweetness, caramel. Zingy finish, minerals, even with water. Later: wooden chest of drawers, light apricot, little bite on the end. ‘Tap dancer with a Tootsie Roll’ (Aultmore 72.82) – red apple and raisin nose, some vanilla. Hot palate, needed some water. Shortbread and red fruit palate. 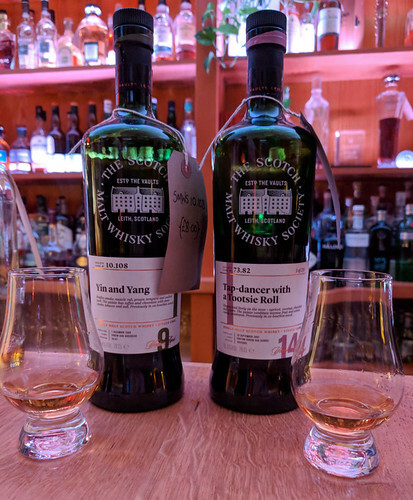 ‘Yin and yang’ (Bunnahaubain 10.108) – popcorn, light smoke, saltiness. Meatiness, cocoa. Just a little heat without water. Campfire by the seashore with a little water. Across the street from our hotel, this basement pub was crowded every time we stopped by around dinner time, but always mellowed out later in the evening. They are well-known for an excellent selection of whiskeys, including many Japanese offerings. Elements of Islay CI8 – light smoke on nose, iodine. Med strong smoke, some iodine, dry finish. Surprisingly balanced at cask strength. Caol Isla Connesieurs Choice – 2017, distilled in 2004. Very light, lots of vanilla. Iodine nose. 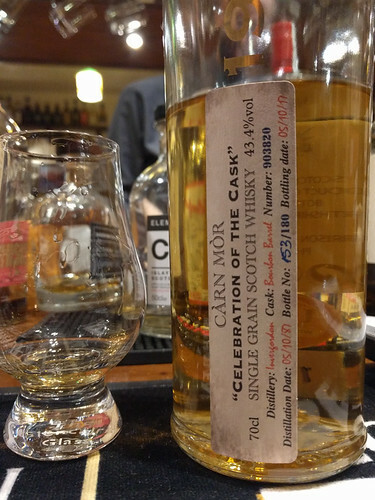 Carn Mor “Celebration of the Cask” Invergordan single grain 30 yr – lots of coconut, £11 pound dram! Some oak too. Leandra’s favorite of the whole trip. 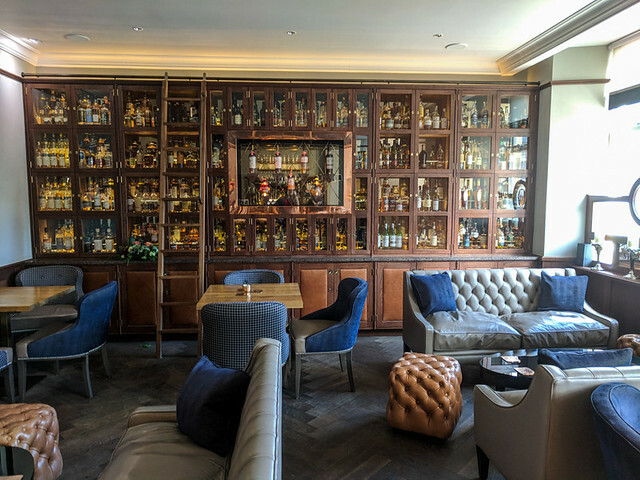 Visited on Sunday afternoon, we found a lovely sitting room with couches and comfy chairs and a wall displaying many of their whiskies, and we had it all to ourselves. This was our first visit but not our last! Douglas Laing’s Provenance Bunnahabhain 8yr – brown sugar, some spice, a nice non-smoky midday dram.